Life has its ups and downs. Sometimes, our "trials" could be downright "trying" and sometimes, real funny, in a weird kind of way. Last Friday, D1 and I took Ethan to MMC's ER. He has been suffering from urticaria (hives) and the medicines given by his dermatologist were not working. The rashes started on Monday night. By Friday afternoon, there was no improvement so we took him to ER. D1 dropped me and Ethan at the sidewalk by the ER's main entry. I must have misjudged the uneven surface of the pavement and next thing I know, I was sprawled (albeit gracefully) on the sidewalk with Ethan standing beside me with that " I-can't-believe-what-just-happened" look on his face. I tried to stand but can't! It is a good thing that a passer-by helped me up while the security guard and triage nurse rushed to me with a wheelchair in tow. I was immediately taken to the triage and asked the usual stuff. Name, Age. Address. I told the nurse that I probably have a record already just to expedite the process. Male Nurse: Ma'm , when did you hurt your ankle? Me: Not more than 5 minutes ago. I knew I should have cleaned my toes! The nurse gave me a queer look. He could not understand the speed in which I was able to bring myself to the ER. So! I told him that Ethan was the "real" patient. That my tripping and spraining my ankle were just incidental. The nurse and orderly wanted to take me to the treatment room ASAP so they could apply bandage and ice on my really painful right ankle and have an ER doctor look me over. I refused since I cannot leave Ethan alone at the ER's waiting room. It is a good thing D1 came waltzing in. When she saw me sitting on a wheelchair she thought that I was just cocky. When I told her what occurred, D1 gave me that " I-can't-believe-what-just-happened" face again. So D1 had to scuttle back and forth between Ethan and myself. 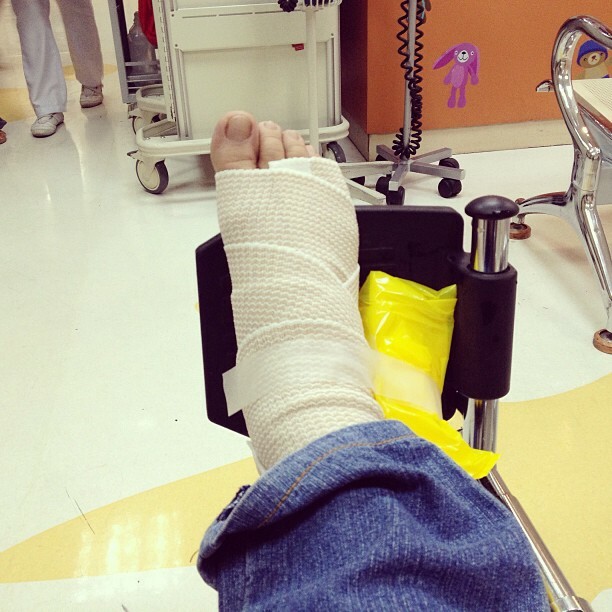 In the end, the orthopedic resident confirmed that I have no fracture, but Ethan was admitted. To make a long story shorter, we are both fine!. Thank you Lord!